I had to go over and find the Keep Calm clipart. I need to use that on Facebook before the election. 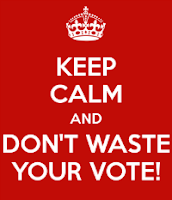 People should not waste their vote. Very good and timely quotation. I've been catching up a bit on your country's presidential race. Praying for you guys and your country. Thanks Pearlie. We need all the prayer we can get.